​Deputy Margarita Ricos is not like every other deputy sheriff. She’s young. She’s tough. She’s kindhearted and smart. She’s a proud Chicana! Raised on the edge of the United States in Terlingua, Texas, she has a broad perspective of “the border,” its people, and its issues. She chooses to remain in the vast land of mountains and desert, a muddy, winding river, fiery sunsets, unique dangers, and indescribable beauty. Margarita is an advocate of justice and fairness in a world that is neither. She takes comfort in the steadfastness of the scenery she adores and her love for and commitment to her community. While still recovering from the loss of her love, Margarita’s birth father comes to visit. He is Sergeant Zeke Pacheco with the Texas Rangers, and he invites her to accompany him to Dallas. He wants to spend a week with his daughter, to take her away from the darkness in her head and the gossip in Terlingua. Also, “if she wants to,” he could use her help on the mysterious case of a friend’s son. The young man is in prison for killing his wife and children. Is he guilty as charged or innocent, as he claims? Margarita jumps at the chance to get to know her father better and to have an adventure in Dallas. And she can never resist a mystery or a chance to right a wrong. She’s quickly drawn into a web of lies and cover-ups, angels and villains, wrongs and redemption. While trying to prove an imprisoned man guilty beyond doubt or wrongly accused, Margarita is haunted by a mystery from her past. 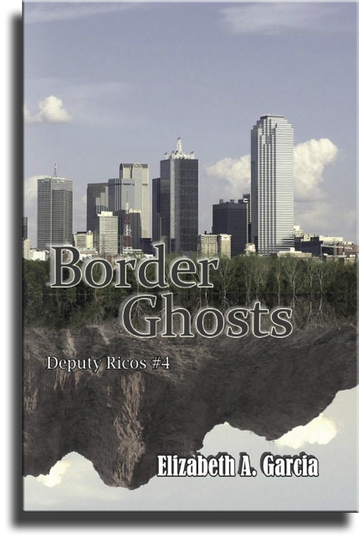 She begins the fast-paced, danger-filled, winding route to the Border Ghosts.